As the sun sets on the longest day of the year, all over the world people feast, dance, skinny-dip, and light bonfires to celebrate the sun’s triumph over darkness. For some, it is custom to jump over the fire to symbolically ward off the cold of the coming winter. Elsewhere fishermen gather on the edge of the ocean to make offerings to the Siren of the Seas to ensure a safe passage and bountiful catch. If the gifts are carried out to sea, this means they have been accepted and their giver will be blessed with good fortune. 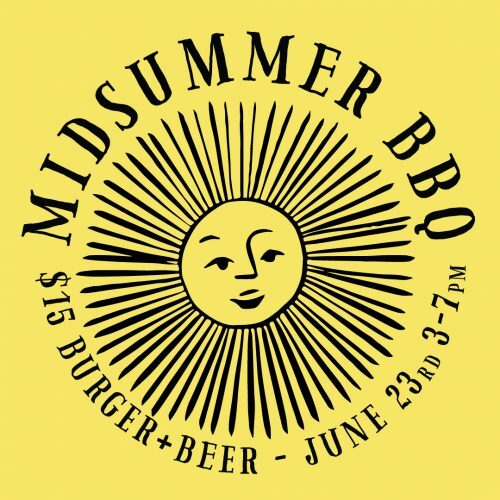 To help ensure luck for the coming winter, join us for our annual Midsummer BBQ inspired by the sun’s brilliance. Cory Curtis will be here to serenade us with sweet summer tunes, and the Big Shucker will be here – shucking oysters of course. Families welcome! $15 for a BEER & BURGER (meat/salmon/veggie) with all the fixings. $15 BEER & BURGER (meat/salmon/veggie) with all the fixings.